I recently flew from Chicago to Washington, DC and back in a Boeing 767. I had a lovely view from my window seat but spent most of the flight nose-deep in "Captain", the latest novel from Thomas Block that features a retrofitted 767 as the crux of the story. A press release about the book arrived at the perfect time, right as I was looking for something new to read and leading up to a week of traveling for work. I had never heard of Thomas Block, but it appears it was not for lack of effort on his part. 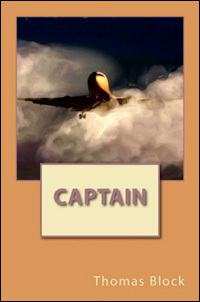 Block spent 36 years as a commercial pilot flying for US Airways but also used his combined love of aviation and writing to develop a second career as an author. He began writing for aviation magazines in 1968 and served as Contributing Editor for Flying magazine for 20 years as well as 11 years as Contributing Editor for Plane & Pilot magazine. 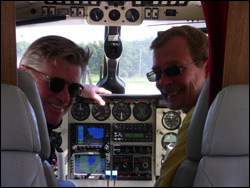 In 2001, he took on the Editor-at-Large role for Piper Flyer magazine and Cessna Flyer magazine. It was in 1979 that he broke into novels co-writing, Mayday with New York Times best-selling novelist Nelson DeMille. In 2005, CBS turned this book into a Movie of the Week. After a hiatus from writing novels, Block returns with his latest thriller, Captain. The story follows what should be a routine Trans-Atlantic airline flight until a chain of events start to tumble out of control putting the entire flight and the airline in peril. The aircraft is a "Consolidated" 768, a re-worked airplane built off the Boeing 767 airframe. Reading about things starting to go wrong for this flight while aboard the aircraft this story was based on helped bring the story alive for me. Without giving too much away, I will say at times I wondered how realistic some of the issues that develop on the plane were, one of which was related to software for the engines. However, as much as I hoped those issues were fiction, I just read about concerns that the Boeing 787 Dreamliner's computer chips could theoretically be hacked and it made this book seem even that more plausible and therefore frightening. Pilots will love this book because there is great balance between the excitement of the story itself, pilot banter and a over-the-shoulder view of what goes on in an airline cockpit during an emergency. I think non-pilots will enjoy the book as well as it does not get laden with aviation jargon and provides a great storyline for all to enjoy. The book is available in paperback for $16.99 or electronically for e-readers like the Kindle, and nook for $6.99. Learn more about Thomas Block on his website. I am constantly looking for ways to share my love for aviation with my kids. We started by making planespotting a daily activity whenever we are outside. Then I added a few trips to the airport to sit in a few cockpits and spotting some takeoffs and even grading a few landings. However, most exciting as of late is their interest in books. They are getting to the stage where they enjoy sitting in my lap to read a book or even to sitting on their own and flipping pages and pointing at neat images (what is neater than an airplane?). A new favorite in our household is the fourth installment of illustrated books featuring Claire Bear, a pink-clad aerobatic performer and mentor for aspiring young pilots. Claire Bear Flies to Oshkosh follows Claire Bear on one of the greatest rights of passage in aviation a flight to AirVenture. The book is beautifully illustrated by Linda Terentiak who does an excellent job bringing AirVenture to life with many familiar sights for those who have attended the annual airshow. The book is my second in a now growing collection of childrens books oriented around Oshkosh sitting on our bookshelf next to Treat Williams and Robert Neubecker's Airshow! Author and Pilot Sue Hughes is founder of Powder Puff Pilot, a great online resource for pilot accessories and gear oriented towards women. Hughes is successfully inspiring the next generation of aviators through her series of books and products on her website. Girls with Wings, is another great resource for aviation products for girls. Check out my Aviation Products for the Whole Family post to find more products geared towards young aviators in the making. Last month Rod Machado released his entire series of aviation handbooks as custom iPad and iPhone applications. Anyone who has read one of Rod's books knows that a side benefit of the knowledge gleaned from his books is the definition those books can provide to your biceps. Out of curiosity, I weighed his Rod Machado's Private Pilot Handbook, and it came in at 5.5lbs, conversely my iPhone weighs just 4.8 ounces and goes almost everywhere I go. I am just getting started working towards my instrument rating and had been thinking of buying Rod Machado's Instrument Pilot's Handbook ($64.95) so I was intrigued when I learned the books were available as iPhone apps ($49.99). Many people can't think of reading a book on something as small as an iPhone but I have enjoyed several books through its Amazon Kindle app. I was curious how Rod's books would work as an app rather than an e-Book through Amazon or other provider. I am happy to report that I have enjoyed the experience. I am only a few chapters into the book but that is several chapters further than I would be if I had purchased the hard copy. I read one chapter while on a commercial flight to visit family over Thanksgiving. I was sitting at 35,000 feet holding a sleeping baby in one arm and my iPhone with the Rod Machado's Instrument Pilot's Handbook app in the other hand. With the hard copy I would never have dreamed of schlepping along a 4 pound book. Another benefit beyond the being able to take the book anywhere is the ability to receive updates. According to Rod's website, users will receive book updates any time he makes changes, with the frequency of changes to regulations and technology this is a great advantage to hard copy books. Traditional eBooks often require you to click on illustration to enlarge them and often don't scale well. However, since his books are stand-alone apps the standard finger spreading scaling works making the process of looking at the thousands of custom illustrations included in the book a cinch. My main request is for Machado and team to update the app to allow highlighted text and to save annotations, functionality that is available for eBooks through Kindle. To make up for this missing functionality, I have resorted to making bookmarks of topics I would have highlighted, then giving them long bookmark titles to include my note or comment. The knowledge that is required for the Private Pilot Certificate or Instrument Rating can be monotonous. Rod's use of humor and great illustrations has helped to keep me engaged while helping me to better understand the subject matter as well. The flexibility to take the book anywhere I go is an added bonus. 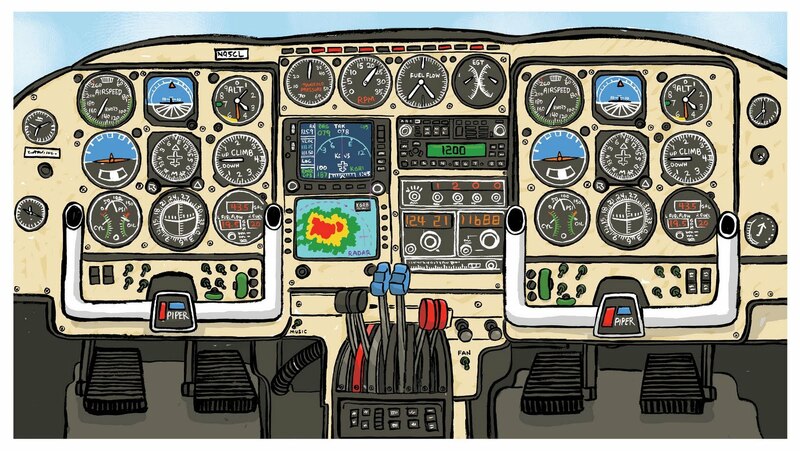 If you are looking to pursue flight training or a new rating and use either the iPhone or the larger iPad I highly recommend you check out his collection of apps. Update to original post: I heard from Rod Machado and he has confirmed that highlighting functionality is being added to the next version of the app. Additionally, they are looking into video and animation inclusions for future enhancements. Glad to hear he has plans to continue to improve this already great product. 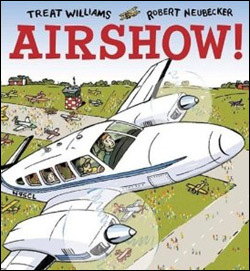 Airshow season is winding down, but if you have kids in the house you can still enjoy the excitement of an airshow with the new illustrated children's book from Treat Williams and Robert Neubecker, Airshow! Treat Williams is an actor best known for his role in "Hair" and most recently in the television series "Everwood", though his real passion is aviation. Williams soloed when he was 17 and has been a pilot for more than 30 years. He met illustrator Robert Neubecker at a release party for "Wow City" where he learned that Neubecker was an aviation enthusiast. They decided they needed to work on a project to share their passion for aviation with kids. I had the opportunity to check out the book and meet the author and illustrator when they flew into the Chicago Area in Williams' Piper Navajo to promote the book prior to the Chicago Air & Water Show. Their mutual passion for aviation was immediately noticeable as we toured the plane inside and out while sharing a few aviation tales. While touring the cockpit I noticed that the instrument panel looked liked the inside panel of the book. Neubecker confirmed it was inspired by that very cockpit. Neubecker also drew much of the inspiration for the artwork from a trip to AirVenture a few summers ago. He and Williams attended the show together to find inspiration and for those who have attended Oshkosh, they will find a strong resemblance between some of the illustrations and their memories of touring the tarmac at Wittman Regional Airport. The story follows a brother and sister, Gill and Ellie, (named after Williams' children) as they join their pilot father and his co-pilot friend for their first fly-in to an airshow. As a new father, I am excited about having a book that will allow me to share my love for aviation with my children. The book includes illustrations of some of my favorite aircraft (B-17 Flying Fortress, P-51 Mustang, DC-3, Piper Cub and many more) and also includes some great aviation radio call dialogue which will be fun to read to my kids. Williams and Neubecker succeed in creating a book that would share their passion for aviation with kids for years to come. 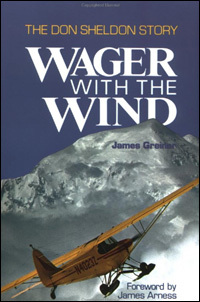 While in Alaska I picked up, Wager With the Wind, an interesting looking book about a famous Alaskan Bush Pilot, Don Sheldon. Shortly after purchasing the book I packed the book into my bag to read when I returned home. Days later, while taking a flight seeing tour, our bush pilot explained as we flew into the Don Sheldon Amphitheater that it was named after Alaska's most famous bush pilot who had built a house on the floor of the glacier in the amphitheater. The name sounded familiar but I did not make the connection between the book, that I had purchased, and my pilot's story. Sheldon had flown in all the equipment for the cabin by air. In some cases he broke many aviation regulations by attaching the wood needed for the cabin to the side of his plane. A few days after returning from Alaska I started the book, mostly to help lessen the effects of my Alaska withdrawl! I was excited to learn the book was about the life of the very bush pilot I had learned about on my flight seeing tour. Additionally, as he was based out of Talkeetna, Alaska for most his life, I enjoyed reading about this town that I had so enjoyed visiting. Even better than reading about Talkeetna were the amazing tales of Don's life as an Alaskan bush pilot. I had always thought the bush pilot's life was a dangerous and courageous one but had no idea what a risky endevour it really was until I read the book. The fact that Don had a full life of flying that was only interrupted early due to cancer is remarkable. What I enjoyed most was that he so unselfishly offered his services to those in need. There are several accounts of him making an unheard of flight manuever in order to rescue climbers, ship wrecked boaters or lost hunters. Almost every effort to climb the mountain ranges around Talkeetna including Denali (Mt. McKinley) during the period of 1940 - 1970 likely involved this world renowned bush pilot. Sheldon was heralded for his amazing ability to land on the sides of mountains. Most of his career was spent flying people to some of the most remote locations in Alaska. The book description states "Don Sheldon has been called 'Alaska's bush pilot among bush pilots'", but he was also just one man in a fragile airplane who, in the end, was solely responsible for each mission he flew, be it a high-risk landing to the rescue of others from certain death in the mountains of Alaska or the routine delivery of supplies to a lonely homesteader." The Seattle Times wrote "We'll wager this is one book you won't be able to put down!" I can attest to that! I think every anyone would enjoy this book but it is an absolute must read for any pilot.